"In early 2007, I was looking to do something positive to mark the fifth anniversary of the death of Joe Strummer when I received a request from a local jail. 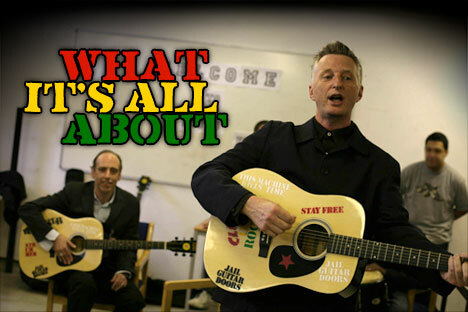 Malcolm Dudley, a drug and alcohol counsellor at nearby Guys Marsh prison in Dorset, was utilising his skills as a musician to set up a guitar class as a means of engaging prisoners in the process of rehabilitation. Borrowing a guitar from the prison chaplain and repairing an old nylon-strung instrument found in a prison cupboard, Malcolm began to make progress with the inmates. However, he soon became aware that their development was being held back by the lack of available instruments on which to practise between sessions. He wrote to me asking for help. I immediately grasped the potential of Malcolm’s work, knowing from my own experience how playing guitar and writing songs can help an individual to process problems in a non-confrontational way. I bought half a dozen acoustic guitars and, just as Joe Strummer had painted slogans on his guitar, had them spray-painted with the titles of Clash songs – ‘Clash City Rocker’, ‘Stay Free’ and, of course, ‘Jail Guitar Doors’. Having delivered the guitars and heard from the inmates themselves about the positive effects of the work that Malcolm was doing, I wondered if there might be other people like Malcolm in prisons across the country, willing and able to do the work, but held back by a lack of instruments. At the NME Awards in March 2007, I announced the formation of Jail Guitar Doors to find such people and meet that need. I am pleased to say that the first person in the room to walk up to me with an offer of support was Clash guitarist Mick Jones. Since then, Jail Guitar Doors has donated instruments to more than 20 prisons. Sponsorship from Gibson Musical Instruments has allowed us to extend our reach beyond the UK. The average cost per prison is less than £500, an amount which could be raised at a benefit concert by any band or artist that can draw a crowd. I’m asking musicians, particularly those of you who were inspired by the Clash, to raise funds to help inmates take the first steps towards rehabilitation. If you’d like to participate in this initiative, please contact me here. Jail Guitar Doors documentary "Breaking Rocks"